To write a tea instructional is to wade into darkly tannic waters long ago claimed by giants like Orwell and Douglas Adams. That hasn't stopped Christopher Hitchens, who writes an open letter on the subject. Nor shall it stop me. First, a survey of the literature. If you look up ‘tea' in the first cookery book that comes to hand you will probably find that it is unmentioned; or at most you will find a few lines of sketchy instructions which give no ruling on several of the most important points. 2. Make it in small batches, out of a pot rather than an urn or a samovar. 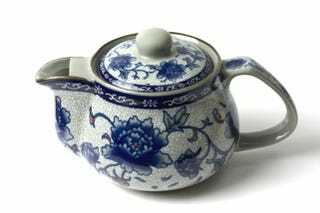 Your teapot should not be silver or enamel, but china. 3. Warm the pot before adding the leaves. Orwell says, "This is better done by placing it on the hob than by the usual method of swilling it out with hot water." 5. "The tea should be put straight into the pot. No strainers, muslin bags or other devices to imprison the tea." 7. Stir the tea leaves and water in the pot before replacing the lid. Steep. 8. Use a mug that is tall, not shallow. 9. "One should pour the cream off the milk before using it for tea. Milk that is too creamy always gives tea a sickly taste." 10. Pour the tea into the cup first. Then add the milk. 11. Drink it without sugar. Orwell believes sugar interferes with tea's taste. There is a very simple principle to the making of tea and it's this — to get the proper flavour of tea, the water has to be boiling (not boiled) when it hits the tea leaves. If it's merely hot then the tea will be insipid. That's why we English have these odd rituals, such as warming the teapot first (so as not to cause the boiling water to cool down too fast as it hits the pot). And that's why the American habit of bringing a teacup, a tea bag and a pot of hot water to the table is merely the perfect way of making a thin, pale, watery cup of tea that nobody in their right mind would want to drink. The Americans are all mystified about why the English make such a big thing out of tea because most Americans have never had a good cup of tea. That's why they don't understand. In fact the truth of the matter is that most English people don't know how to make tea any more either. 1. "Go to Marks and Spencer and buy a packet of Earl Grey tea." 2. "Go back to where you're staying and boil a kettle of water. While it is coming to the boil, open the sealed packet and sniff. Careful — you may feel a bit dizzy, but this is in fact perfectly legal." 3. "When the kettle has boiled, pour a little of it into a tea pot, swirl it around and tip it out again. Put a couple (or three, depending on the size of the pot) of tea bags into the pot. (If I was really trying to lead you into the paths of righteousness I would tell you to use free leaves rather than bags, but let's just take this in easy stages.)" 4. "Bring the kettle back up to the boil, and then pour the boiling water as quickly as you can into the pot." 5. "Let it stand for two or three minutes, and then pour it into a cup." 6. "Some people will tell you that you shouldn't have milk with Earl Grey, just a slice of lemon. Screw them. I like it with milk." 7. "If you think you will like it with milk then it's probably best to put some milk into the bottom of the cup before you pour in the tea. If you pour milk into a cup of hot tea you will scald the milk." 8. "If you think you will prefer it with a slice of lemon then, well, add a slice of lemon." 9. "Drink it. After a few moments you will begin to think that the place you've come to isn't maybe quite so strange and crazy after all." [T]ea is a herb (or an herb if you insist) that has been thoroughly dried. In order for it to release its innate qualities, it requires to be infused. And an infusion, by definition, needs the water to be boiling when it hits the tea. Grasp only this, and you hold the root of the matter...It is already virtually impossible in the United States, unless you undertake the job yourself, to get a cup or pot of tea that tastes remotely as it ought to. It's quite common to be served a cup or a pot of water, well off the boil, with the tea bags lying on an adjacent cold plate. Then comes the ridiculous business of pouring the tepid water, dunking the bag until some change in color occurs, and eventually finding some way of disposing of the resulting and dispiriting tampon surrogate. The drink itself is then best thrown away, though if swallowed, it will have about the same effect on morale as a reading of the memoirs of President James Earl Carter. 5. Serve the tea in a tall mug, not a shallow cup. 6. Add the milk to the tea, not the tea to the milk. The fact is that making tea is one of the simplest pleasures available to mankind; All of these guides strike me as somewhat unnecessarily complex. And the pervasive attitude of English superiority is irksome. A touch of that tone might be understandable, perhaps, given the chilling atrocities against tea (and the chilling of tea) commonly perpetrated in the U.S. — just a week ago, I found myself trapped in a hotel room with three plastic-wrapped Twinings teabags of unknown age, the only available means of heating water an in-room coffeemaker that by design does not reach the boil. I was expected to whiten my brew with a packet of non-dairy creamer. But the rah-rah Rule Britannia stuff is a tiresome pose — especially, in Hitchens' case, given how publicly fond he is of his newly acquired U.S. citizenship. These men are making tea out to be some kind of privileged knowledge, which it's not. They write as if tea were an invention of the British crown lovingly bequeathed — like the gift of "civilization" itself — upon the colonies, of which America is merely the most ungrateful. They also write as if tea had not been contentedly and knowledgeably consumed for millennia in India, China, and elsewhere. And if any of the above writers actually does hope to prompt Americans to consider tea differently, berating the Yanks for their ignorance (while simultaneously figuring tea-making to be some kind of intimidating dark art) is hardly likely to have any such effect. I say this: People should drink the tea that they enjoy, in the manner that they prefer to prepare it. There are more and less effective ways of preparing tea, to be sure, but a lot simply depends on taste. There is no snobbery quite like tea-snobbery, but it's such a drag. Some dedicated tea types will only ever use loose leaf tea — but while it's true that loose tea brewed in a pot has superior flavor, making tea with a bag is by far a more economical use of one's time. And some of my favorite cups of tea were made from nothing fancier than Dilmah tea bags, prepared hastily with friends as soon as we'd kicked off our regulation brown shoes and loosened our ties after school. These days, sometimes the phone rings or something happens on the blog, and I oversteep a pot of tea and have to reheat it. (Hitch, I'm so bad!) In a pinch, I've even made passable tea in the microwave. Once you know the routine, you can improvise. I'm a lifelong tea drinker and I'd put my brewing bona fides up against the best, but I still tend to think of tea kind of like I think of young adult literature: It's not as important what kind of tea people drink as that they are drinking tea. By tea, of course, I mean anything green, black, oolong, or white. Though in practice I personally drink primarily black tea, with milk (and one-and-a-half sugars). Tea is not rooibos, or chamomile, or mint, or Celestial Seasonings Red Zinger: those things are tasty hot beverages that happen to be tisanes. If it's not infused from the dried Camellia sinensis plant, then it's just not tea. Tea is a tasty, potent blend of antioxidants, and you can drink several deeply comforting cups of it daily without getting the caffeine jitters. Regular drinkers of black tea have been shown to have lower levels of stress hormones than non-tea-drinkers. Tea also has healthy amounts of tooth-friendly fluoride, which is kind of a nice trade considering it also stains tooth enamel over time. And despite the fact that tea contains caffeine, it's been found to hydrate the human body as well as water. Preparing tea is easy. The main thing — and the most obvious area of commonality between Hitchens, Orwell, and Adams — is that everything used in the making of tea must be very hot. All the warming and boiling and swishing of hot water can be made to sound complicated, but it's actually operating on a very simple principal: Because the hottest brew is the most flavorful tea, the entire tea-making process is about taking the hottest possible elements, mixing them together in the hottest possible environment, and then preserving as much of that heat as possible as they infuse. You want the main vessels used in the preparation and consumption of tea to be very hot, in the same way and for the same reason that when you mix a martini you want your shaker and your glass to be very cold. When you have ideal tea-making conditions — a few minutes to yourself, tea, a teapot, and a strainer — and you want to make black tea in the English fashion, boil some water. Boil about twice as much as you think you'll need. Warm the teapot. A pleasing curl of water vapor should rise from the bottom of the pot as you open its lid. Add your tea. With loose leaf tea, allot one heaping teaspoon of per cup, plus one for the pot; As Orwell advises, don't bother with tea balls or infusers. If using teabags, give one bag per cup and one for the pot. Pour sufficient boiling water over the tea. Stir. Cover. Steep for 3-5 minutes or as long as you prefer. Then serve it how you like it. If you use sugar, be aware that a metal teaspoon left in a cup after stirring is but a vector by which heat will leave your tea. Presto. Cures what ails you. Now, I diverge in the strongest of terms from the Orwell/Hitchens methodology on the milk question. They aren't "wrong" in any absolute sense, it's just that Orwell recommends a method that bears a higher risk of adverse results, and yet does not make possible any greater reward of flavor. I say this: When you are brewing tea in a pot, and intend to enjoy this tea with milk, it's best to first fill your mug with a little milk and then pour in the tea. Orwell's argument that the milk-first approach makes it too easy to overfill one's mug with milk, and therefore screw up the milk/tea ratio, is specious: Make a few cups of tea, and motor memory will be your guide here. Remember, tea is basically water that's just three-ish minutes from being 100 degrees Celsius: It is a liquid more than hot enough to scald milk. Especially considering you will be using something like 1% or 2% fat milk, because as Orwell correctly points out, full-fat milk or cream gives tea an unpleasant mouth feel; The mix of astringency and lipidic fullness that is so pleasant in coffee-with-cream is all kinds of wrong with tea. The lower the fat content, the more prone the milk is to scalding. Adding the milk after the tea is tempting fate. What you should do instead, if you want to enjoy your tea with milk and you are brewing it in a pot, is this: When the kettle has boiled and the tea is brewing, take the boiling water and pour it into your mugs. Swirl it around, and toss it into the sink. Then pour the desired amount of milk — something between a splash and a dash suits most people, but use however much you like — into each warmed cup. During the time that it takes the tea to brew, the milk will come to room temperature, or warmer, in the cup. Meanwhile, the tea will be gradually cooling from the full boil in the pot. When you add the piping-hot-getting-slowly-cooler tea, through a strainer, to the warm-getting-slowly-warmer milk, you'll equalize the temperatures, without scalding. Slowly. Slowly is key. That's really all there is to say. The main point is to drink it and love it and to love drinking it. I think I'm going to make a pot now.